Now the Emmy(R)-winning journalist, nutrition advocate, certified personal trainer, and mother of two offers her real-world strategies for overcoming adversity and systematically improving your total well-being. 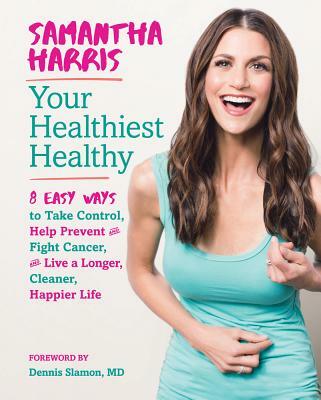 Your Healthiest Healthy combines her humorous, sometimes harrowing, always inspiring journey with research-backed advice, insights from doctors and scientists, and effective tips into an easy-to-follow, eight-step road map. Her practical advice will empower you to eat better, work out smarter, reduce toxins around you, master your medical awareness, handle health crises, strengthen your relationships, boost your positivity, and build resiliency. With this complete program, you can maximize your health, energy, and happiness for life. Samantha Harris cohosted Dancing with the Stars for eight seasons, garnering two Emmy nominations, and served as correspondent and weekend anchor on Entertainment Tonight, where she earned two more Emmy nominations and a win. A certified personal trainer, she has appeared on the covers of numerous health and fitness magazines. Named Survivor of the Year by Susan G. Komen Race for the Cure Los Angeles 2017, she led the 2018 Parade of Promise at Dodgers Stadium and also serves as a spokesperson for the American Cancer Society. She founded the online community GottaMakeLemonade.com to inspire positivity in the face of adversity. She lives in Southern CA with her husband and their two daughters. Visit her @SamanthaHarris on Twitter and at Samantha-Harris.com.